Everyone who has ever tried Kahoot loves it. We love it because it is fun, exciting, and a great way to review material. However, have you ever tried to use it to introduce new material? If you haven’t, you may want to take a look at Blind Kahooting. A Biology teacher names Steph Castle appears to be credited with creating the Blind Kahoot! and it’s actually a pretty genius idea. It’s using Kahoot! to introduce an entirely new subject, one for which they have little to no knowledge. Q1 – Introductory Question – this question sets the scene and brings the students on board with the topic and/or the main goal. Q2 – Toughest Question – ask the toughest question you can think of about this topic or goal. This question, if answered correctly, should demonstrate that the student understood the topic and could move on. Note: is not just okay that they get the question wrong, it’s expected. Now, you explain the question and the answer to your students. This gets you going on the topic or goal. Q3-? – Reinforcing Questions – Ask a series of questions that will take the students through the topic. The goal is for them to practice what they’ve just learned. You will also explain each answer after the question is finished. Basically you are using these questions to deliver your content and checking for understanding all at the same time. You may even want to ask the same question several different ways to ensure they are understanding the topic. Last question – Ask your Toughest Question again. Can also be an application question. Should combine all the items learned in the Kahoot! Wash, rinse, repeat – To introduce another topic or part of the topic, start the process all over. When completely finished, be sure to leave enough time for the students to try to beat their score using Kahoot!’s Ghost Mode. How to use Kahoot! to teach new topics – video from Stephanie Castle that explains, in detail, how she designs a blind Kahoot! The Art of Blind Kahoot!’ing – great overview guide to creating a blind Kahoot! 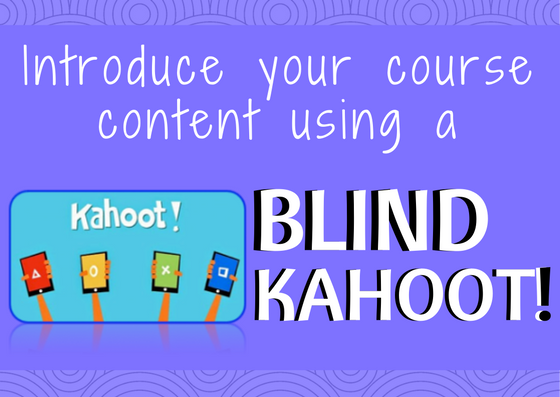 Step-by-Step guide to creating a Blind Kahoot! Inspiring ways to Kahoot! – cool ways to use Kahoot! For more than just review.